There are 2 sections dedicated to customizations of the contents sections. 1. 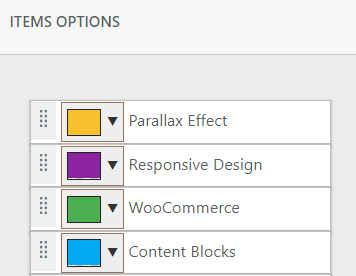 From the green cog icon on the right hand, in the list of content sections – in the customizer. Click on the green cog icon and open the panel with the 4 areas mentioned above. Section Spacing – this defines at what distance exactly the content section is from the section above (section or header), and to the section below. Set larger values for more space from the top and to the bottom, or smaller values for less space from the top and to the bottom. The background type may be set to transparent, colored, image or gradient. Transparent – Select this option if you want the content section background to be transparent. In this case, the page background image will be visible in the backend. The overlay is a semi-transparent color that is applied on top of the background, for a nice visual effect. 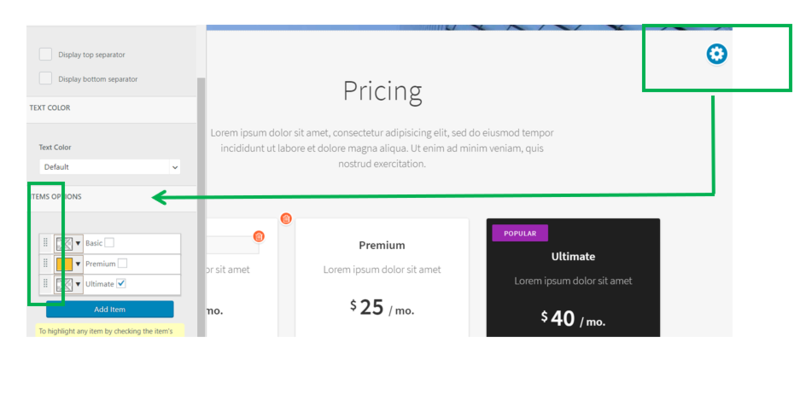 Select the color of the background overlay and apply it to the content section background. Separators are graphic elements that help separating the content section from the rest, and make it stand out. 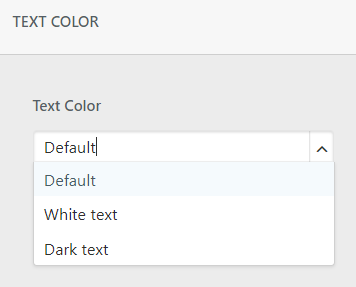 This section is for adjusting text colors, so they fit into the background color you have selected for the section. You can select a dark color if the background has lighter nuances, or a white color if the background has darker nuances. Or you can keep the default selection. Make Full Width/Make Centred – This option allows you to change the layout of the entire section from full width to centred and vice-versa. Change background – This will open the panel for customization of the content section background. You can replace the current background with another one. 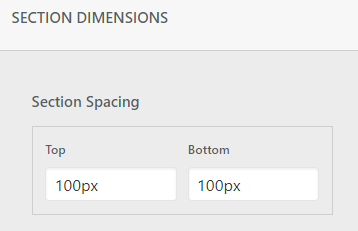 Section Settings – This will open the panel for customization of the content section settings (dimensions, background, separators, etc.). You can replace the current settings with others. Add Item – This option is valid only for content sections that contain lists. Click on Add Item, to add a new item to your list. Columns per Row – This option is valid only for content sections that contain lists. Click on Columns per Row, to set 1, 2, 3, 4, 6 or 12 columns per one row. 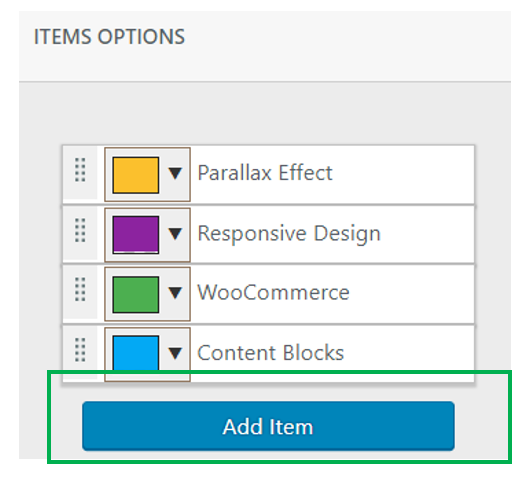 Reorder Items – This option is valid only for content sections that contain lists. 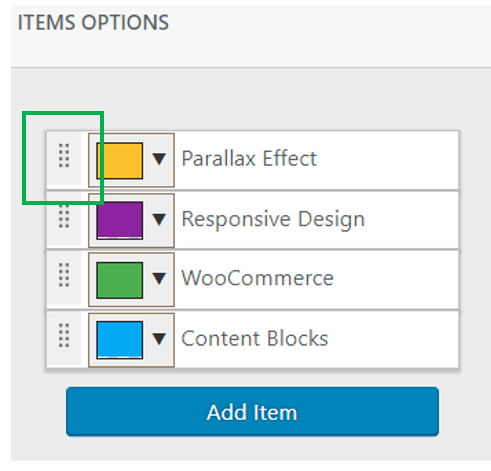 Clicking on Reorder Items will open the panel for customization of the content section items.